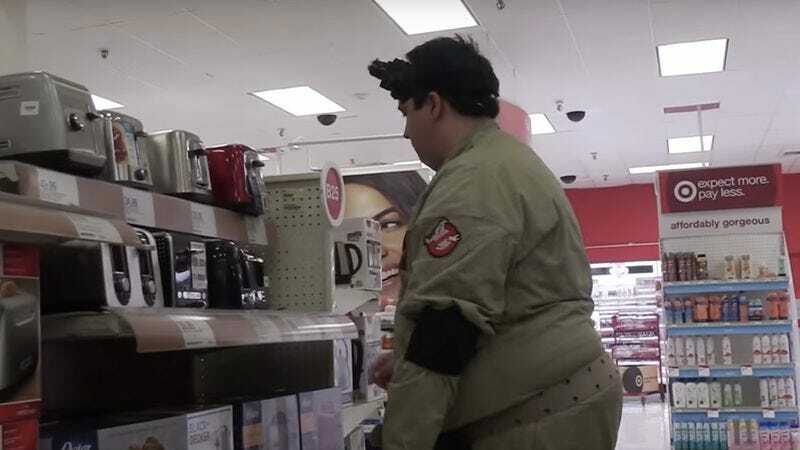 As far as Halloween costumes go, you can do a lot worse than dressing up as a Ghostbuster. The outfit is objectively badass, plus Dr. Peter Venkman and associates get a lifetime “Cool Dude Pass” for saving NYC from scores of floating ectoplasmic baddies. (Again, nice work, guys.) But what if you opt to don those Ghostbusters duds on a night other than Halloween? And instead of one night you make it an entire week? What then, smart guy? Humorist Danny Gallagher recently chose to find out: For seven long days he went about his business clad head-to-toe in a Ghostbusters jumpsuit. In Dallas. In the middle of a summer heat wave. Why? Well, apart from being a lifelong fan of the supernatural comedy, Danny is a full-fledged sociophobe looking for a wee bit of exposure therapy. And although we’re not Tobias Fünke-level analrapists, it’s safe to say those unrelenting stares from everyone within a 100-foot radius can lead to a pretty significant breakthrough. Or, you know, a complete meltdown. But definitely one of the two. Here’s Danny’s firsthand account of the experience, which may very well be crazier than that time Egon tried to drill a hole in his head.